I’m a zombie today. I was up every 45 minutes to an hour last night with the kids. Where they get the idea that mom doesn’t need to sleep is beyond me. I’ve made it very clear on many occasions that I prefer a full night’s sleep to frequent wake up calls. Silly boys. Since all I want to do is sleep right now I’m showing you something ridiculously simple today. A couple years ago for Christmas I received Alton Brown’s I’m Just Here for the Food: Version 2.0. See I’m being good and working on Operation 2012. I knew how easy it was to make homemade popcorn, but I had no idea I could make homemade MICROWAVE popcorn. Seriously, you can! You can have the convenience for the microwave without all the extra oil and greasiness of store bought bags. 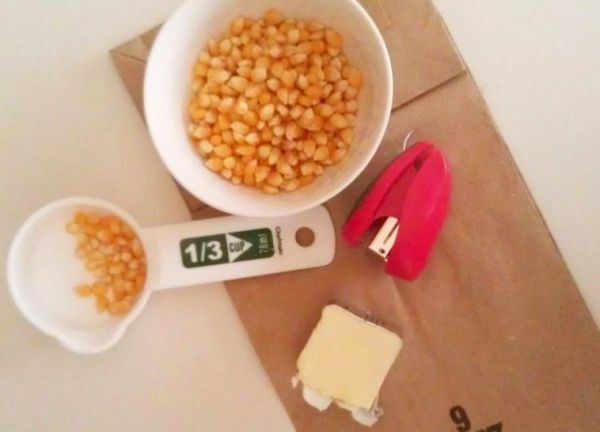 Pour the popcorn into a paper bag and fold the top of the bag over twice to close (each fold should be 1/2 inch deep; remember, the kernels need room to pop). Seal the bag with 2 staples only, making sure to place the staples at least 2 to 3 inches apart. Put the bag in the microwave and cook on high power for 2 to 3 minutes, or until the pops are 5 seconds apart. Remove the bag from the oven and open it carefully, avoiding the steam. 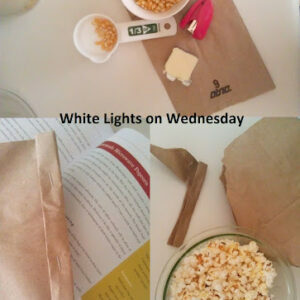 Pour the popcorn into a bowl and drizzle with the butter, then toss with salt. I know you’re probably freaking out at the idea of putting metal in the microwave, but it’s okay. I made this and my kitchen didn’t go down in flames. Here’s what AB has to say about this method. ooh! I do this too!! So much less garbage (preservatives) in the popcorn! I don't use staples though, just fold my paper bag over. Works great too. The key is figuring out your microwave's heating to know how long to make it all pop. 🙂 Trial and error! I think next time I make this I'm going to start with half power so the popped kernels don't get over done. I will probably ditch the staples too if I can get by without them. Thanks for the heads up. I have to try this! I'm your newest follower, I'd love ti if you could follow me back, can't wait to check out the rest of your blog!